Thanks to data from the European Space Agency's XMM-Newton X-ray satellite, a team of international scientists found a comet-like ball of gas over a thousand million times the mass of the sun hurling through a distant galaxy cluster over 750 kilometres per second. This colossal "ball of fire" is by far the largest object of this kind ever identified. The gas ball is about three million light years across, or about five thousand million times the size of our solar system. It appears from our perspective as a circular X-ray glow with a comet-like tail nearly half the size of the moon. "The size and velocity of this gas ball is truly fantastic," said Dr Alexis Finoguenov, adjunct assistant professor of physics in the Department of Physics at the University of Maryland, Baltimore County (UMBC), and an associated scientist at the Max Planck Institute for Extra-Terrestrial Physics in Garching, Germany. "This is likely a massive building block being delivered to one of the largest assembly of galaxies we know." The gas ball is in a galaxy cluster called Abell 3266, millions of light years from Earth, thus posing absolutely no danger to our solar system. Abell 3266 contains hundreds of galaxies and great amounts of hot gas that is nearly a hundred million degrees. Both the cluster gas and the giant gas ball are held together by the gravitational attraction of unseen dark matter. "What interests astronomers is not just the size of the gas ball but the role it plays in the formation and evolution of structure in the universe," said Dr Francesco Miniati, who worked on this data at UMBC while visiting from the Swiss Federal Institute of Technology in Zurich, Switzerland. Abell cluster 3266 is part of the Horologium-Reticulum super-cluster and is one of the most massive galaxy clusters in the southern sky. It is still actively growing in size, as indicated by the gas ball, and will become one of the largest mass concentrations in the nearby universe. 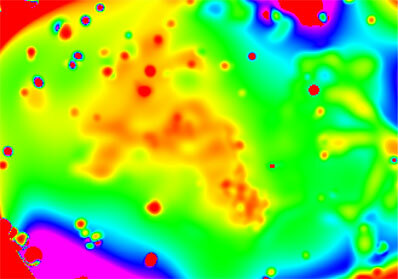 Using XMM-Newton data, the science team produced an entropy map (entropy is a thermodynamical property that provides a measure of disorder). The map allows for the separation of the cold and dense gas of the comet from the hotter and more rarefied gas of the cluster. This is based on X-ray spectra. The data show with remarkable detail the process of gas being stripped from the comet's core and forming a large tail containing lumps of colder and denser gas. The researchers estimate that a sun's worth of mass is lost every hour. "In Abell 3266 we are seeing structure formation in action," said Prof. Mark Henriksen (UMBC), co-author of the results. "Dark matter is the gravitational glue holding the gas ball together. But as it races through the galaxy cluster, a tug-of-war ensues where the galaxy cluster eventually wins, stripping off and dispersing gas that perhaps one day will seed star and galaxy growth within the cluster." The findings, resulting from a research effort led by the University of Maryland, Baltimore County, appear in the 1 June 2006 issue of the Astrophysical Journal (volume 643, page 790). The European Space Agency's XMM-Newton X-ray mission was launched in December 1999. With its powerful mirrors, it is helping to solve many mysteries about the most energetic phenomena taking place in the Universe.